Welcome to Part 3 of the Bridal Collection I delivered to A Beautiful Touch in January. If you'd like to see the rest of the collection, here is Part 1 and Part 2. 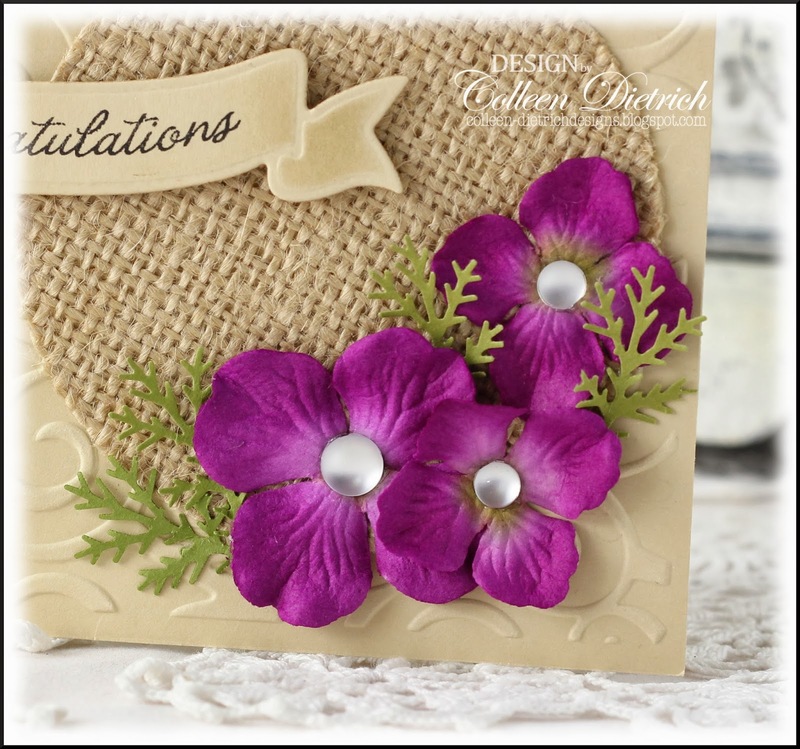 These rich purple blossoms from Prima remind me of orchids, a very tropical flower. I added a frosted gem to the center of each, because they look like sea glass. 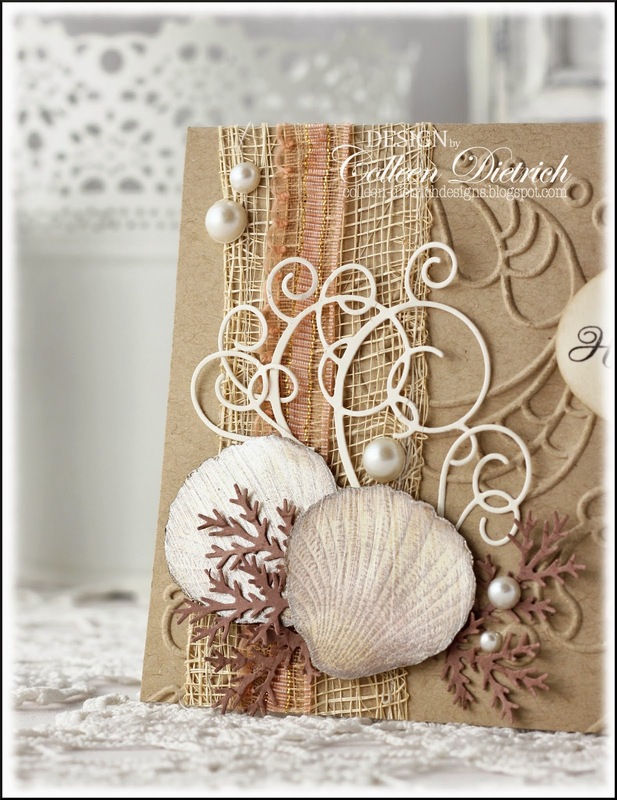 The burlap has a beachy feel, and the swirls on the embossing folder resemble waves. The embossing reminds me of tossing waves, as do the swirly die cuts. Pearls come from oysters, and I've got scallops here. After stamping the Blockheads seashells with cocoa ink, and sponging them with subtle Distress ink colors, I applied a thin coat of shimmer paint. (all supplies listed below) I've still got a bit left of this fabulous abaca ribbon left from years ago (here's a current link if you'd like to buy a similar roll), and topped it with peach-and-gold ribbon from Webster's Pages. The branch punches, done up in cocoa, remind me of sea fans. ETA: I'm entering this at Simon Says Stamp's 'Wedding or Anniversary' challenge. The next card is similar to one found in the Bridal Collection - Part 2. I love how Bella Toile / Stampin' Up! looks stamped in white on a black background. Added some more goodies found in the bridal section of the craft store in a corner (leaves, flower topped with pearl), and added a swirly die cut. There's a thin strip of black glitter cardstock along the long edge, too. I'm unveiling the last part of the Bridal Collection tomorrow. Be sure to stop back! AWESOME Collection ! I loved the sea themed cards more..wonderful textures and colors ! These are gorgeous! LOVING the burlap and mesh pieces!!!!! Love some beach wedding cards. The shells and tropical flowers make we want to be on a wonderful beach...somewhere, anywhere. Of course, the other cards are so just elegant..can't help but love them. 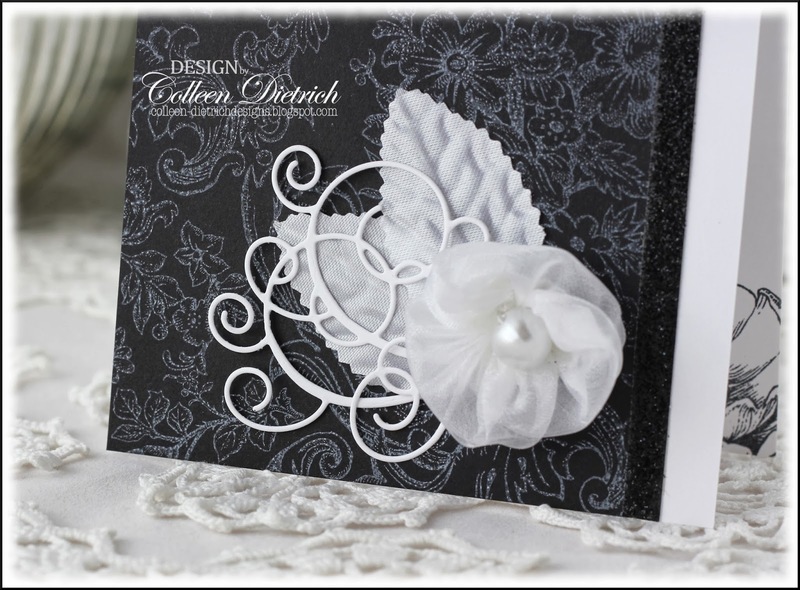 Gorgeous wedding cards, Colleen! All so very unique and beautiful! Just love those beach themed cards, which are perfect for a beach wedding! 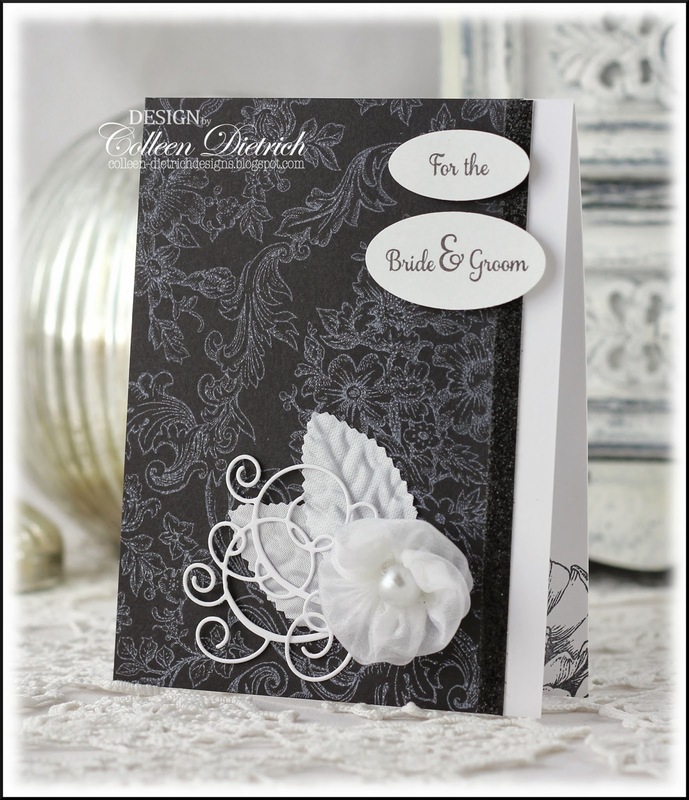 I'm totally blown by the gorgeous wedding cards you have been posting Colleen! These are too gorgeous! love each one of them..the purple blooms with frosted gem centre..Stunning!!! Wow Colleen this is another trio of beauties!! The first is my favorite, love the depth and texture! Oh my; Colleen this is out of this world beautiful. Some card making brand should offer you a job. I can only sigh and stare. You are so talented! More beautiful and captivating designs! I bet you can guess what this solar powered girl likes the most. All three are TOTALLY stunning. Sooo beautiful ,amazing textures , colours and designs.. a visual treat , love your work ! Love, love, love the beach-themed cards. Love all 3 of these! 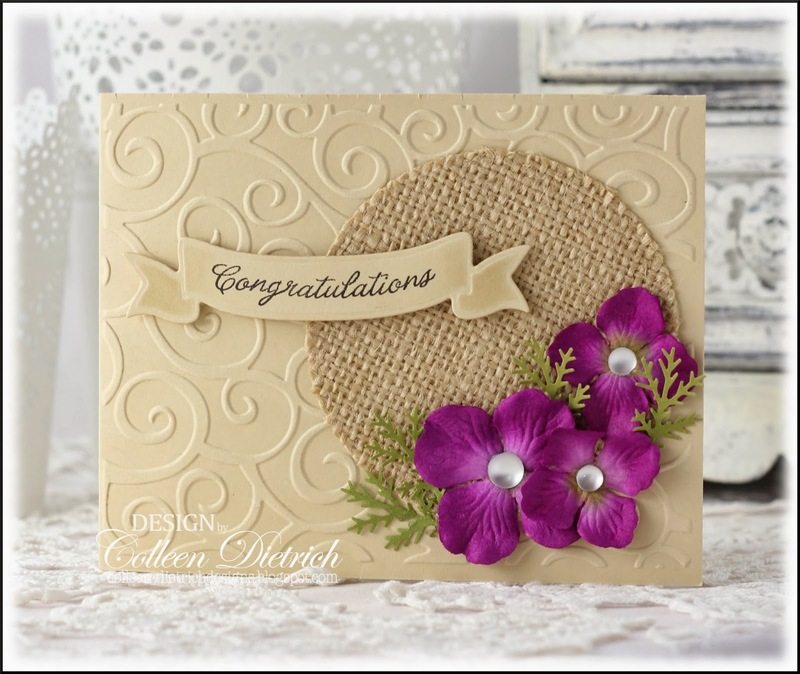 That purple is gorgeous and the beachy card is so perfect to a warm, sunny wedding. The elegance of the 3rd is just lovely! Wow! Each one is prettier than the next! LOVE them all! These are gorgeous, truly gorgeous!!! And I love the beachy themes. 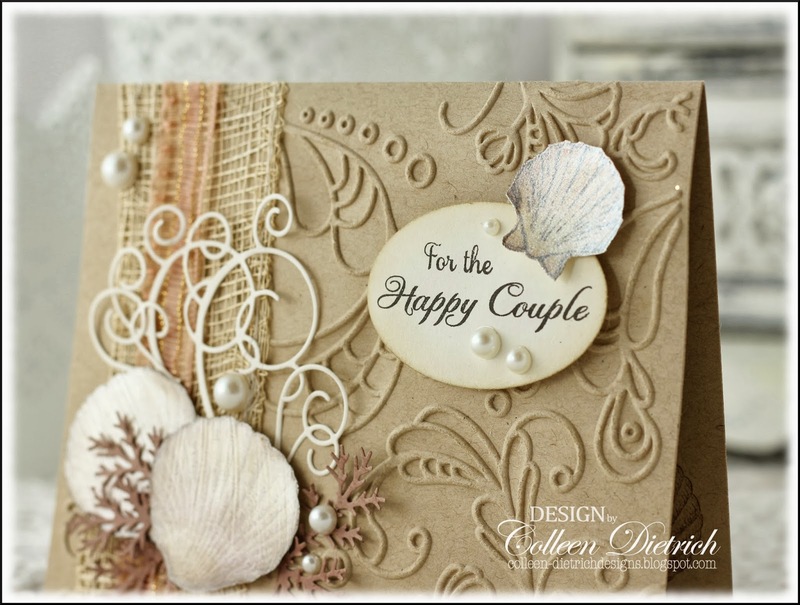 Wow, that shells card is just STUNNING, Colleen!! You are really going all out for your wedding card collection. I think these are just going to FLY off the display racks at the bridal shop! ooh i love the beach one here as well . I am also swooning! These are beautiful, Colleen! 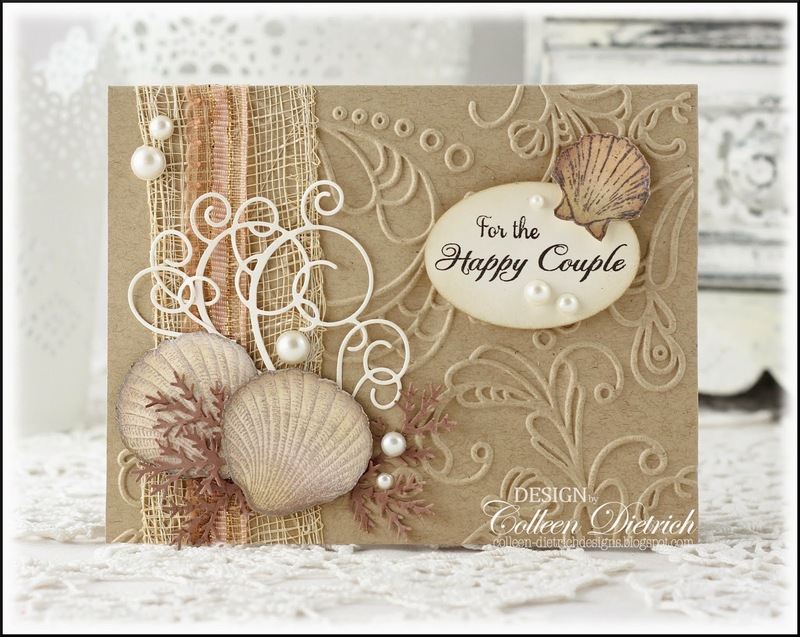 Oh, how I love the beachy cards! I thought #1 might be one of my favorites yet (love the shade of tan with the burlap, embossing, and flowers), then #2 came up and totally WOWED me with its embossing, shells, ribbons, and swirly die cut... Still loving the black and white, too. I see a peek at some stamping inside which looks like a lovely finish, too. All fabulous! Wow! Colleen, more elegance. Your sea shells just really take me away, the embossed BG, and the flowers!!! Love love love your bridal collections ... wonderful and I hope you sell tons!